I am on a grassy, alpine balcony, high above my favorite village in the Alps. Nearly 40 miles and 10,000 feet behind me, one of my best days in recent memory is winding down. I’m tired, but I don’t want this moment to end. Shadows are moving ever faster across the valley floor below my feet. These moments, I think, are fleeting. “Remember this,” I tell myself. Everything seems very nearly perfect. There’s just one problem, and his name is Bluto Blutarsky. I look down at the bucolic village, and wonder if anyone there knows about Bluto, the John Belushi character from one of the great films of my childhood, Animal House. In the scene of which I am thinking, Bluto is moving his lunch tray across his college cafeteria’s stainless-steel rails, and he is grabbing everything he can reach. Everything. Burgers. Chocolate eclairs. Deviled eggs. Tapioca pudding. You name it, it’s piling up on Bluto’s tray. It–my own Bluto-esque, post-run moment–happens a few times a year, and it’s always the same. Why me? Life’s not fair. Kilian runs through three countries, and all he eats are berries he finds along the way. Why do I have be the one that wants to eat a wheel of cheese? The food-fight scene in ‘Animal House.’ Photo is a screeenshot from the film. If I can just finish this run, I promise, next time I’ll have oatmeal for breakfast. With raisins. And peanut butter, too. Lots of peanut butter. If you’ll just please go away, Bluto. I’m going to crash and burn and end up walking. I know it. That one Gu that’s been in my pack since the Nixon administration isn’t going to get me through the next six miles. I am hungry. Really, really hungry. And so, Bluto takes charge. He conjures up pizza smothered in oily cheese. He reminds me of the thick, juicy burger available at the local café, now less than an hour away. Bluto doesn’t care. He’s like that. Bluto’s appearance makes sense. In college, I remember studying Maslow’s hierarchy of needs. Food is at the bottom of the pyramid, right after air and water. If you’re missing food, you might as well forget everything higher on the pyramid, like love, following your dreams and—oh yeah—self-esteem, too. And so, today, my cerebrum—that part of my brain that controls food drive—has gone farther off the reservation than Colonel Kurtz. The modern Bluto, er, the author at a European bakery. Photo courtesy of Doug Mayer. The diorama that is this Alp valley fades and my thoughts turn inward. For the next half hour, I mentally review everything in the fridge in the little apartment I’ve rented for the summer. What can I create? How quickly can I make it? This is the way my run finishes. I don’t see the herd of cows that mark my arrival back into Champery. I only casually note the clockwork-like final descent of the tram to the village, and the departure of the 7:34 train to Monthey. That’s the power of Bluto Blutarsky. In most of life, fulfillment can seem anticlimactic. Not so, when Bluto’s around. I am a junkie, and the heroine has just hit my veins. My vocal chords surprise me with an obscene noise that will make me look at the floor tiles when I see my neighbors the next morning. But, right now, I could care less. Twenty minutes later, Bluto’s still hanging around the apartment. I shower and head to the local café, where Bluto and I bargain. No meat, but I go for the most filling thing I can find—croute au fromage—bread baked with thick layers of local cheese. A half hour later, I’ve turned a 57-kilometer run with 4,000 meters of vertical into a calorie-positive day. What the &*$#*$ just happened, I wonder. In school, no one taught us that the hierarchy of needs is an ever-changing thing. But now, I know better. Too often, I’m careless about managing my calories. Bluto will be back, I know it. I just don’t know when. But when he comes, I hope there’s food nearby. When have you pulled a ‘Bluto’ post-run? Where you finish so famished you could eat about anything, and so you do? What kinds of foods do you crave or indulge upon when in post-running Bluto mode? 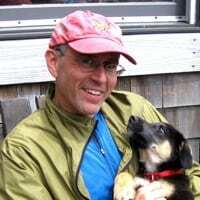 Doug Mayer is a producer for the NPR Show, Car Talk, and owner of the Swiss trail running company, Run the Alps. He lives in Randolph, New Hampshire, at the base of the northern Presidential Range. I'm not surprised you're always hungry if all you eat are refined carbs. You should get more protein in your diet. Surely your comment is meant with the same exaggerated jest as the content of this article? :) I think this piece is the author’s attempt at expressing in a humorous manner the desperation and kind of hunger one feels after long days of running, rather than presenting a literal list of what he eats. Ha! Fun read. Yes, those carbs are tricky. To my own surprise I am really good with my post-race nutrition. I tend to crave healthy stuff after a run. A beer too, of course. But I'll put that on the healthy side too. Bluto starts bugging me whenever I DON'T run. Especially at work, I am terrible. You should see my co-workers terrified faces over the amounts of sweets that I can stuff into me. Not a good thing. The worst is during a taper! I'm so hungry all the time! I actually had to download myfitnesspal to start tracking my food during the taper to keep myself honest about what i'm eating. In 2013 I ran the Black Hills 100 in Sturgis. About the only thing I remember after sunset is a seemingly endless conversations with another runner (Dan Rose), about the keg of Crow Peak Brewing cream ale awaiting us at the finish line and a donut shop Dan had visited in Rapid City the morning before, in grotesquely sexual terms. After enjoying a 4 a.m. post race beer (one of the best beer experiences of my life, and I've had Dark Lord), I caught a nap in the back of the Jeep, attended the awards ceremony, and then headed east to Spearfish for a proper visit to Crow Peak (the Pile-O-Dirt Porter is fantastic, BTW), and then trekked back west to Rapid City to check out Firehouse Brewing Co., where I started my meal with a plate of nachos and an amber ale, followed by a green chile burger with fries and an Irish red (weird combo, I know). I concluded the night by driving to the local grocery store, grabbing a trio of donuts form the "day old pastry case" and sleeping in the parking lot overnight. Good fuh-CAN times!